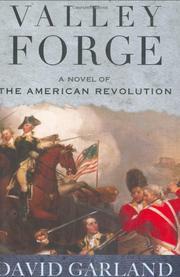 In book two of Garland’s saga (after Saratoga, 2005), the Brits frolic, the rebels freeze and the author falters. Valley Forge—by now, it’s a great big iconic lump of a story that if treated conventionally will murder any attention span. So there’s Captain Jamie Skoyles (conventionally intrepid) of His Majesty’s 24th Foot, languishing in Cambridge, Mass., a prisoner of war, having been taken during the Battle of Saratoga. Unable to abide that shame, intrepid Jamie escapes: “Because it’s our duty as British soldiers,” he explains to a friend. Accompanied by his sweetheart, the almost, but not quite, as intrepid Elizabeth (she’s only a woman, after all), he makes his way to Philadelphia, where the skylarking General William Howe enjoys to the hilt the role of conqueror. Kept at bay is General George Washington’s brave but out-gunned band of insurrectionists. Valley Forge, 20 miles northeast of Philadelphia, is, of course, famously unpropitious as a place to spend a winter. Ill-housed, ill-clothed, ill-fed, the penned-up Continentals grow increasingly ill-tempered due to an unappreciative and unforthcoming—in terms of the necessaries—Congress. Depression takes hold, desertions mount and yet the rag-tag army and the “damnably deficient Washington” have managed to distract Howe and his minions from their old time in the occupied city. Howe needs someone to get close to Washington, he tells Jamie, to “bamboozle” him, search out his weaknesses. Jamie agrees to become a spy, and so adept at it is he that the heretofore astute American general buys into an implausible cover and, if not actually bamboozled, teeters on the edge. And so it goes. A stick-figure cast speaking hopelessly wooden dialogue drains the life out of Garland’s tale—and the rest is history.